I want to give Mindy a great big hug right now! We got back late last night from a whirlwind trip to Arizona for a funeral and as I was making my list of things I had to do to catch up today, I had all but decided to just skip our usual Valentine's Day traditions. Even though they are our favorites, I just felt too overwhelmed. Then I saw this picture on Instagram and remembered it doesn't have to be as big and crazy as I sometimes make it out to be. 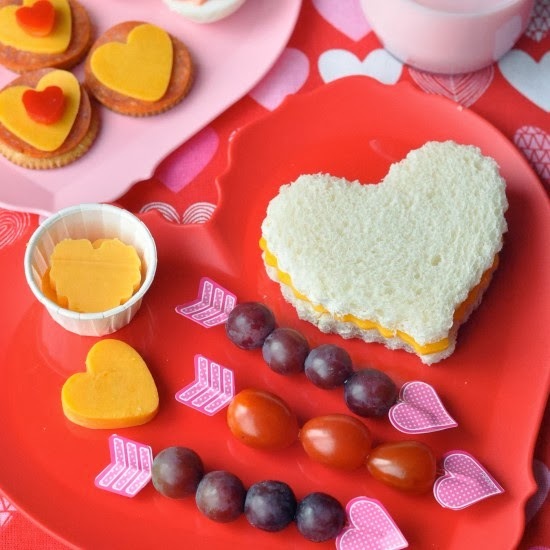 Her Valentine lunch ideas are super easy to put together, absolutely cute, and if I switch that sandwich out for grilled cheese or even a panini that I cut out in the shape of a heart, it will work just find for dinner too. That is why I own so many heart shaped cookie cutters, right? You can check out all of Mindy's great Valentine lunch ideas over at Creative Juice.